Joey's home!!! Just got him home from the vet today. He's been there since Friday. He's still very sore but doing great! I sure did miss him! Update on Joey: The nurse called today to let me know how he's doing. She said he's doing great!! He's eatint good and went for a 20 min walk. If he's healed from the trauma of the attack they will do surgery tomorrow. Please still keep him in your prayers for the surgery. Yesterday my Joey was attacked by a bigger dog from across the street. He has two holes in him & his lung just missed from being punctured. Our Vet said by getting him there so quickly his prognosses looked good. Joey is very special to me. He was born the same day my Mom passed. I named him after my Mom JoAnn. Losing her left such a big hole in my life. So my loving Hubby got me Joey to feel that hole and help ease the pain of losing my Mom. And he has!! Joey has the same color eyes(green) as my Mom. When I look in his eyes I see her. I simply can't lose him like this. I did visit him today. They couldn't get him to eat or walk and wanted him to. I brought his food he ate a big handful! And walked over to me I cried! They said that was good but he's not out of the woods yet. They don't know the extent of lung or heart damage yet. He is scheduled for surgery on Monday 12-12-11. Please pray for my Joey!! 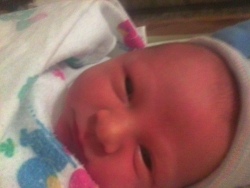 Hunter Michael Rogers! 7# 9oz. My Grandson! Thank you Destinty & Mallory. Alyssa and Hunter are doing good now. They are excited about being first time parents. And we are excited about being Grandparents!! Congrats on the baby, Lynell. Tell Alyssa to take care and congrats on being a new Mom. Being a first time Mom is awesome. 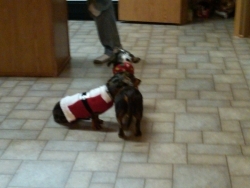 I hope they are both ok.
Rue is too cute in her Christmas sweater!! 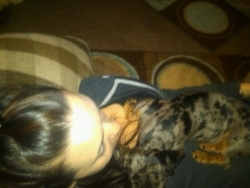 It's jacket weather again, not an easy job with 11 Mini-Dachshunds.lol Keep me updated. Love the pics! Mallory, Thank you so much for the updated pics on Rue. We have three that sleep with us one on each side of me, Lucy has to be on the left. That is "her spot" lol. Happy to know that Rue is doing well! Lisa, Thank you so much for your concern. I've just got alot of brises. And my rib is getting better. Glad your o.k!! Great dog , you have there! Thanks, Wade for your concern. I'm just bruised up alot. especially my left rib. Thank you for the compliment on my Babies. Glad you're O.K Lynell. 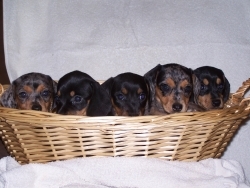 We need you around to breed the great mini-dachshunds that you do. I just read your story about Lucy. 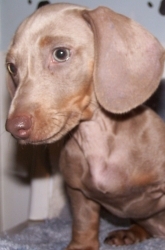 I had a Mini-Dachshund and always thought her to be amazing too! I didn't know they could also be rescue dogs. It sounds like you went through quite abit. But you didn't say if you were alright. Hope you are! WOW!!! Over 3000 Visitors!! A special Thanks to those visitng my Website!! Mallory, Just checked my e-mail and saw the pics. Rue looks like she is very happy and adjusting well in her new home. Please feel free to contact me with any questions or concerns. Also keep us updated as Rue grows and becomes a happy dog! Lynell, I just sent you a few picture of Rue, they are on my phone, they might now be great but I love her to pieces, she is so much fun and adorable, my black lab is terrified of her its the funniest thing! She is a wonderful puppy !!! 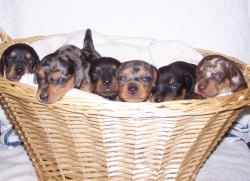 Thank you to David Silas who bought a Female Black&Tan Dapple! I called to check on her. Her name is Roux and she is doing great. Also Thank you to Brigttte Wilhite! She bought a Black & Tan Female and named her Bella. Brigette will be boarding Bella with me for a while. Caroline's Puppies are doing great! They are starting to walk and are developing fine. Thank you to those who have purchased a puppy! We still have five available.